I highly recommend it, one of the top pieces of English literature I´ve read in years. He wrote this autobiography after graduating from Harvard Law school and being the first black editor of the Harvard Law Review, early 1990s I think, which got him a lot of attention and thus a book deal. I picked it up because I wanted to learn more about the man, and I thought it was nice a political biography was written before he became a serious politician, as such I assumed it would be more genuine then the usual sloganism and propaganda of political manifestos. My overall impression right now of the man is left-wing heart, moderate mind, tons of tenacity, long-term focus, supremely gifted genetically for intelligence, and fascinating family and cultural background. 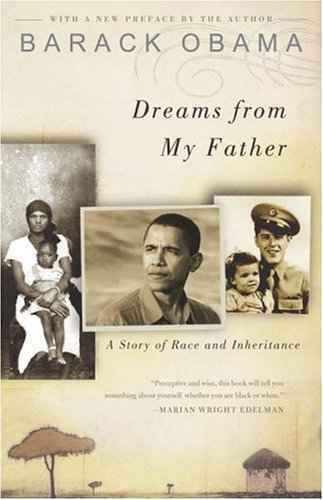 The book is split into a few main sections, a history of his (white) family on his mother´s side and how she met his father, a discussion of the time in Indonesia, and then the time in Hawaii (high school), undergraduate at Columbia, his activism in Chicago when he was a community organizer, and then his visit to Kenya before going to Harvard Law. He only briefly discusses Harvard Law in the epilogue. His family background is very complicated. His father married his mother in Hawaii, while he had another wife back home in Kenya. They split up when thew father went to Harvard, as he didn´t have enough money to support them. The father had a few more wives after that, including one other white wife, and it´s very interesting in the Kenya chapter when he meets all his family. After the mother split with the father, she moved to Indonesia where she married another man, Lolo, who in the biography came off as an excellent stepfather. From that relationship Barack got a sister, Maya. He´d move to Hawaii for high school, he had trouble adapting to the culture of the different sports for example, as nobody played soccer or badminton. There´s an amusing anecdote from when he was young, he told his classmates his father was an important tribal prince in Africa, that he was very important. He was crushed and afraid when he heard his father was visiting and would speak to the class about Kenya for an hour. It turned out ok and his classmates were impressed with his father. For those who are curious about the media meme that his grandmother is not really his grandmother, his father´s biological mother ran away from home when his father was 9, because of her husband´s behavior. He was then raised by another wife of his father, and that was the woman Barack Obama Sr. considered his mother, feeling his biological mother betrayed him. The older sister Sarah, being old enough to understand the treatment her mother was receiving, felt differently. I have not read in a long time a piece of african american literature, and such a description of the african american experience. Racism is a central meme of this book, and several events are discussed such as Obama´s alienation. What I thought was the most interesting section was when he spent a year, or maybe it was two, as a community organizer in Chicago. I found it a very insightful description of the racial situation there in the 1980s. His first success at organizing, I think, was when he found out the city of Chicago had jobs banks virtually everywhere, except in the black neighbourhood where he was working, Altgeld. His second success was on the issue of asbestos in public housing pipes. Altogether I am impressed. While it is of course a biased expose as it his life in his words, realistically the average 30 year old (his approximate age when he wrote it) would have little to show that would be interesting in an autobiography. He had a lot and he demonstrates strong character. one of the top pieces of English literature I´ve read in years. Did I misspell a word in that sentence? Otherwise no I´m not kidding, your reaction is bizarre, without explanation, and altogether antagonizing. That you only found the first sentence worthy of quoting implies an attitude. Admittedly, I only read like 10-15 novels a year. An excellent post 500. Obama is impressive is his own right. But did you really need to throw in the "supremely" gifted genetically for intelligence? I've mostly heard that "intelligence" is not genetic. Correct. Intelligence of Obama's sort is not inherited. It is not genetic, you are correct. Unionist, that is very well put! If you review the literature on the subject it becomes apparent that among those who actually study the matter intelligence is clearly partly genetic, just as height or probability of cancer is. For example, children who are adopted have their adoptive parents IQs as children, and their biological parents IQs as adults. In the case of Obama I was kind of set aback as I was reading his family ancestry. Both his father and his paternal grandfather came off as supremely gifted, which puts Obama´s talents on context. In the case of his paternal grandfather it manifested itself in rapid adaptation to the ways of the white man... he earned high praise as a ¨servant¨ which says a lot about the damaging effects of colonialism on Kenya (a lot of interesting anecdotes on that). In the case of his father, he was always top of his class in grades with little effort. His father dropped out of high school as he found one of the competitive high schools in Kenya to be too easy. He went back for private tutoring later on and got into the university of hawaii on scholarship. Some, such as Geraldine Ferraro, have argued that Barack Obama is only where he is because he is black. If he were somebody else he would be somebody else, that much is tautological, but as he is he is one very gifted human being. You really get the impression from the book that Barack Obama was set for a strong role early on. There is absolutely zero connection between a child's intelligence and the intelligence of the child's parents--in terms of genetics? Well then. As an adopted person, I can agree that my IQ may be more in line with my biological parent but I'm more intelligent thanks to my adoptive ones. You mean he borrowed it? Rented it? Stole it, God forbid??? In all studies the connection is unequivocally firm. Behaviorism is something people believe because it makes them feel good and is in accordance with their normative views. Anyhow, that is off-topic. People who want to promote Watson and Skinner´s behaviorist views should (please!) start another thread. Let´s discuss Obama please. My main point is that he demonstrated unequivocal potential early on and that his near-ancestors were impressive as well, if someone disagrees let them say so directly. Intelligence quotient is very different than intelligence. Intelligence quotient is a western construct. For example, children who are adopted have their adoptive parents IQs as children, and their biological parents IQs as adults. Political partisanship is inherited, even by adopted children. Right-wing parents produce left-wing adolescents, and vice-versa. Whoops, you're right, sorry for the drift. I think Obama has a pedestrian mind and a mouth that is for sale. Did I earn, borrow, steal or rent the fact I´m 181 centimeters? No. He was a gifted kid who demonstrated tremendous potential early on. Read the book if you don´t believe me, I think you would be most interested by the section on his volounteerism in Chicago. I was asking about intelligence, not IQ. What do you think of Obama´s capabilities? Until you edit your OP I think I'd rather stick to my concern. The same holds true then. Genetics has nothiing to do with it. Mostly privilege does in the Western meaning of "intelligence"
Is merely that based on your assessment of his P.Q. ("political quotient")? Whatever you think of Obama, he's obviously a very bright person (relative to the average person). Bill Clinton, for all of his faults, is another example of a person who is extremely intelligent. Did Obama actually write the book or is it just ghostwritten like 99% of all other political memoirs? He did not get into Harvard law on the basis of his dead black Kenyan father´s inexistent millions - that much is certain. Genetics has nothiing to do with it. I'm not an expert regarding the study of intelligence and genetics, but in the materials I've searched for in the past, I don't see any studies that say there is absolutely no connection between a person's intellectual abilities and their genetic makeup. Most of the studies that I've seen say that intelligence is the result of both a person's genetic makeup and the person's environment. He wrote it many years before he became a politician, about five to ten years before. He took a lot of time off after Harvard Law school to work on it. The work os his which receives more attention is ¨The Audacity of Hope¨, that one may have been ghost written as he wrote it recently, after his political career had begun. No, also his lack of principles (hence "mouth for sale") - such as his callous and uncivilized condemnation of his spiritual mentor, and abandonment of his church, the very instant that that become politically (i.e. monetarily) expedient. These acts alone place him far below people like McCain in my estimation. That makes him more dangerous. If he were brain dead, I wouldn't waste any words on him. That is certainly an interesting spin. First his pastor became controversial, then Obama wrote one of the top political speeches of modern times defending him. Then his pastor decided he enjoyed media attention, waffled on the issue of whether or not AIDS was created by whites to kill blacks, and on Obama´s comments, said that he was ¨being a politician¨ implying Obama was dishonest. Only then did he sever contact with Wright. He has no responsibility of loyalty to those who betray him. What I'm trying to get at is intelligence is not measurable. The only studies have been designed by white men for white people in the Western patriarchal dominate way. It would be more accurate to say "people with particular social location" than "white people". People who share that social location will do well, regardless of their skin colour. People who do not will do less well, regardless of their skin colour. You mean like Obama´s Kenyan father, raised in a village in the third world, who almost starved to death at age nine, whose mother ran away from home, who dropped out of school... yet managed to get a scholarship to Hawaii and then Harvard back in the 1960s? (like his son did later on). Yup, he demonstrated skill and did reasonably well because of his priveleged upbringing - of course. What I'm trying to get at is intelligence is not measurable. I agree that intelligence is not easily measurable. It's difficult to quantify...and any attempts to do so will be imperfect. But that there are differences in intelligence from one person to another is indisputable. The question that I have is that what causes those differences. I think that it's a combination of biology and environment (and the only real question is the relative weight of biology versus environment--something that is spiritedly argued among those studying the matter). Thank-you RosaL for improving on my misguided effort on classism. The only studies have been designed by white men for white people in the Western patriarchal dominate way. It would be interesting to know what scientists in, say, China or Japan or India, who are studying intelligence say about the matter. I'm going to take a break and try to be clear in what I'm saying. It is not indisputable that there are clear differences in intelligence. Like you agreed it is difficult to quantify. The problem is in defining what intelligence is. empathy and understanding of humans? Them IQ tests mostly deal with logical reasoning not subjective application. There are plenty of brilliant poor people! Every once in a while, some privileged person becomes aware of a brilliant poor person and helps that person get an education. They'd probably say the same thing, Western classism has been sold well all around the world. I think there probably is a genetic component to intelligence, just as there is to physical strength. But I think it would be very difficult to find a way to measure that genetic component and I'm not sure why the attempt should be made. It is not indisputable that there are clear differences in intelligence. You're saying that a mentally retarded person (or you or me, for that matter) is just an intelligent as an Einstein or Hawking? If so, that's laughably absurd. Now, measuring the differences in intelligent is difficult. But, to assert that there are no differences in intelligent from one person to another is not even legitimately arguable. Class wasn't invented in the West. Thought about that as soon as I posted. I should add we probably imported the class thingy. Anyways, if 500 had of just withdrawn the "supremely gifted genetically for intelligence" I would have been out of here. Think I'll do that now. I guess Rev. Wright should count himself fortunate that he is still alive! Here's the difference between you and me, 500. I support the entire thrust of everything Wright said, and I oppose the entire thrust of everything Obama said. You, like some others here, seize on the AIDS thing out of desperation, because your very instinct, your every fibre, demands support for the status quo. Not just in this thread or on this issue. In every single thread, and on every single issue. Now, what kind of discussion would you like to have in the face of that rather obvious reality? I once took a test that purported to measure logical reasoning. One question asked who would be most qualified to discuss politics, a doctor or a plumber. I trust it's obvious that this is not a test of logical reasoning - it's a test of logical reasoning given that you share the social/political assumptions of the test writer! I got the wrong answer to this question. I said, "the plumber", not because I can't reason logically but because I was reasoning within a different belief system. Where did you take a test with a question like that in it? The intelligence test reminds me of when I got my learner's permit to drive. Didn't have to demonstrate any spatial, reflexive, vision or decision making capability. But you could get perfect and still be the worst driver in the world. It's awful, isn't it? It was some time ago and I would hope that things as blatantly biased as this have been weeded out! Watch a sec. You're saying that the test didn't properly measure skills but you're willing to conclude that some drivers are better than others? I don't think anyone is denying that people acquire different levels of knowledge and skill in different areas. The test was only written for a learner's permit. Meaning, I got perfect and had a permit to drive but that didn't mean I had any clue how to. Well---look at what we have here! oldgoat goes off to the seaside to drink gin for a week, and what happens? People start behaving like a scene from the movie Lord of the Flies! No wonder babble doesn't have (many) anarchist sociopaths and Pol Pot supporters, it's far too rough for them. I agree with you on this, RP. That line from 500_Apples' post about inheriting intelligence stuck out a bit for me too when I read it, but I really don't think this thread was meant to be a nature-nurture debate about cognitive function, you know? Very interesting and all, but perhaps people might like to comment about the substance of the book, as related to us by 500_Apples, rather than disputing a throw-away line he used in his review of the book? Perhaps someone could start a thread about the whole "nature-nurture" debate about intelligence. Personally, I think the book sounds really interesting. I haven't read it myself, although now I'm thinking about reserving it at the library after reading 500_Apples' review. I can definitely see how a well-written book that traces a true story of an African American family's ancestry could be considered a great piece of literature. 500_Apples, I'm going to move this thread to the babble book lounge forum so that it will be more obvious that this discussion is about the book than a general thread about Obama's politics. Ditto for me - I read other reviews that made me want to read this book and now I think I'll stop putting it off. Haven't had a whole bunch of reading time lately, but maybe it's a good excuse to hang the hammock. You know that is absolutely hilarious. I´ve been posting for like 2 years, but this is my first book review I think (wait, I remember another one) and I didn´t even realize there was a babble book lounge! Honestly, if I were running for office, and someone whom I had trusted and defended said ¨David N. is just saying that because he´s a politician you know he has to say that¨ I would be pretty pissed off, and I might very well break off relations with that individual. I completely agree with the main thrust of what Wright said, as did Obama for that matter if you bothered to read his long speech on race. Agreemant on the whole, disagreemant on details.